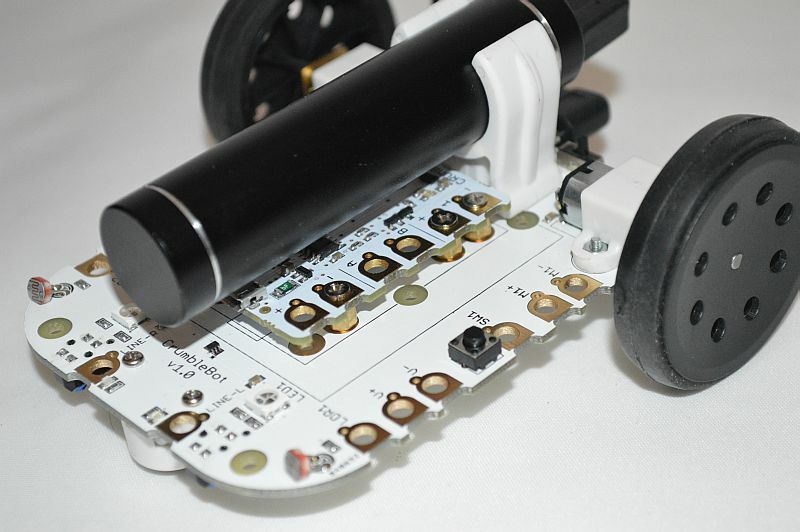 V2.0: Use 10 of the small 5mm screws to fit the 10 small pillars on the top of the CrumbleBot. 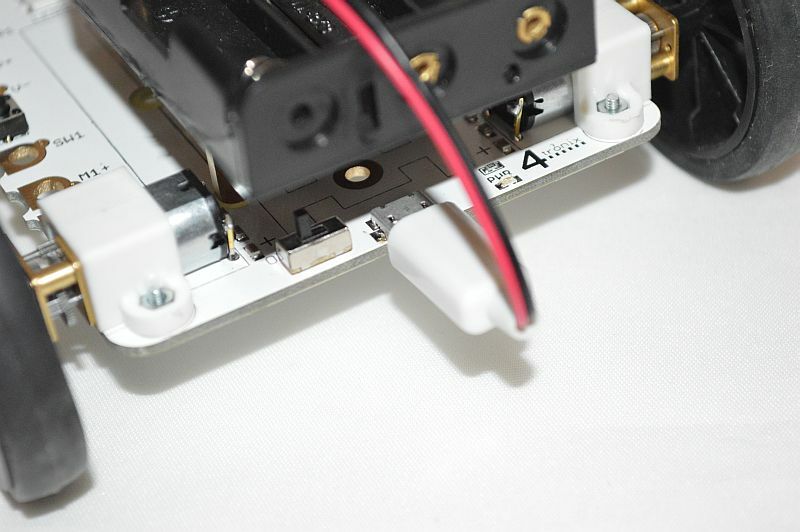 Use the 10 M3, 4mm (for v2.0 use the remaining 10 small 5mm) screws to attach the Crumble to the 10 pillars fitted in Step 3. 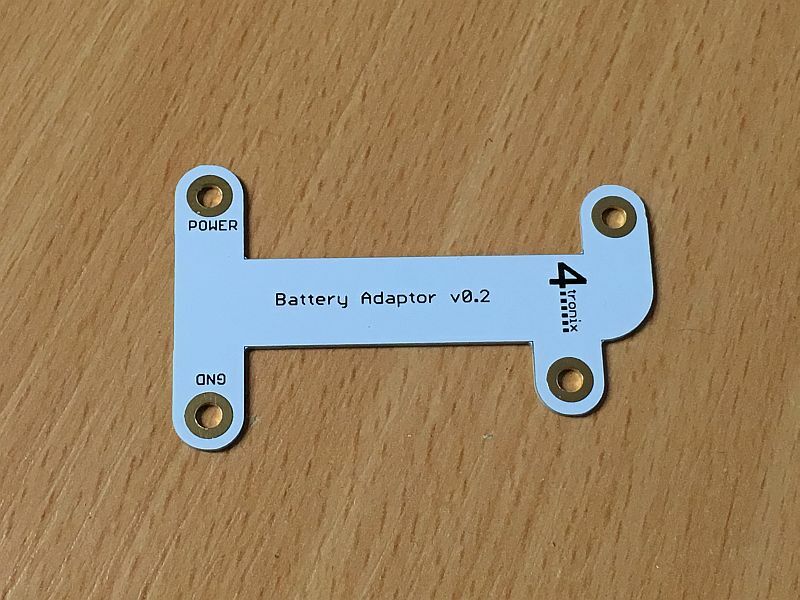 User the remaining 2 longer 8mm screws to fit the battery holder to the 11mm pillars. A good starting point for the jumpers is in the middle two positions on the left side, and the outer two positions on the right side. 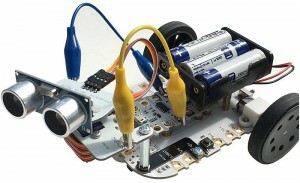 This allows use of the line sensors, sparkles and buzzer without changing anything. Using the four 6mm screws, screw the two 20mm pillars into the front accessory connectors. 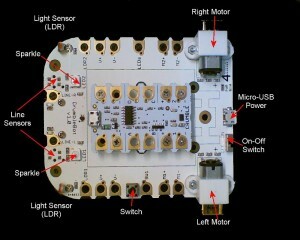 Then screw the sensor module onto the top of the the two pillars as shown above. To connect the sensor to the Crumble, you must use one of the 12cm jumper wires to connect to a GPIO pin. 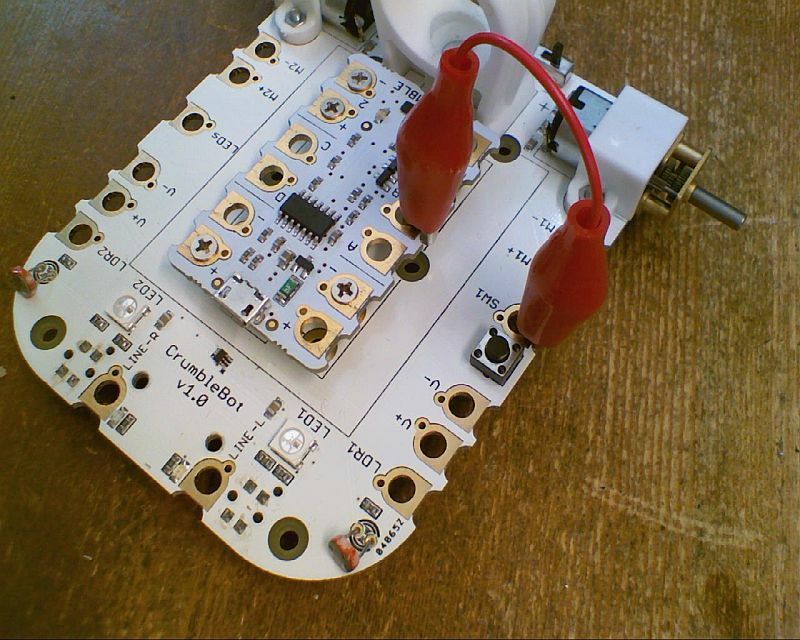 All our examples use GPIO A so wire it as shown in the photo above. 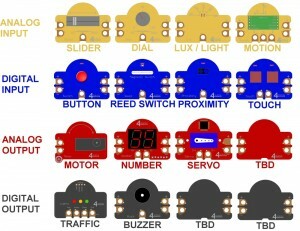 Remember to remove the Yellow jumper attached to GPIO A. 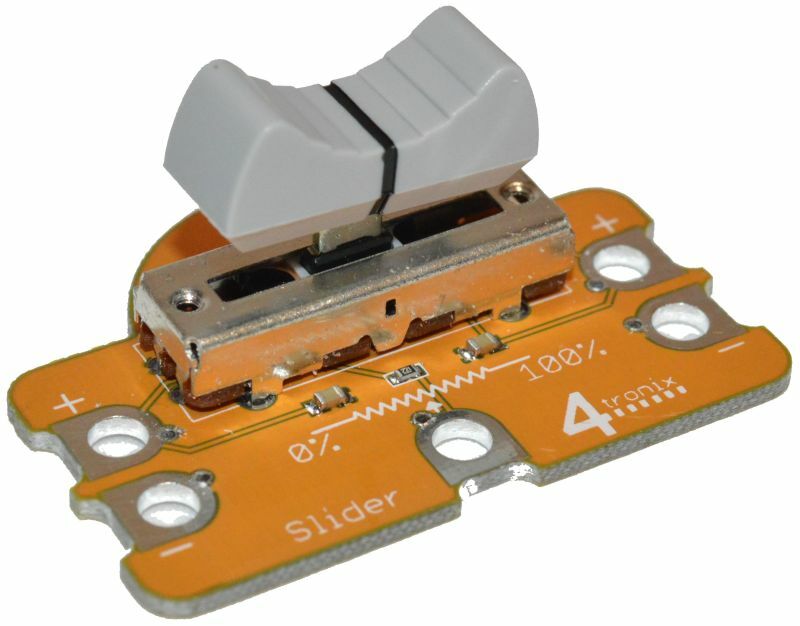 Now you can use the distance block in the Crumble software, setting both T (Trigger) and E (Echo) to the same pin. A in this case. Your CrumbleBot Mk2 is Finished and ready for Coding! 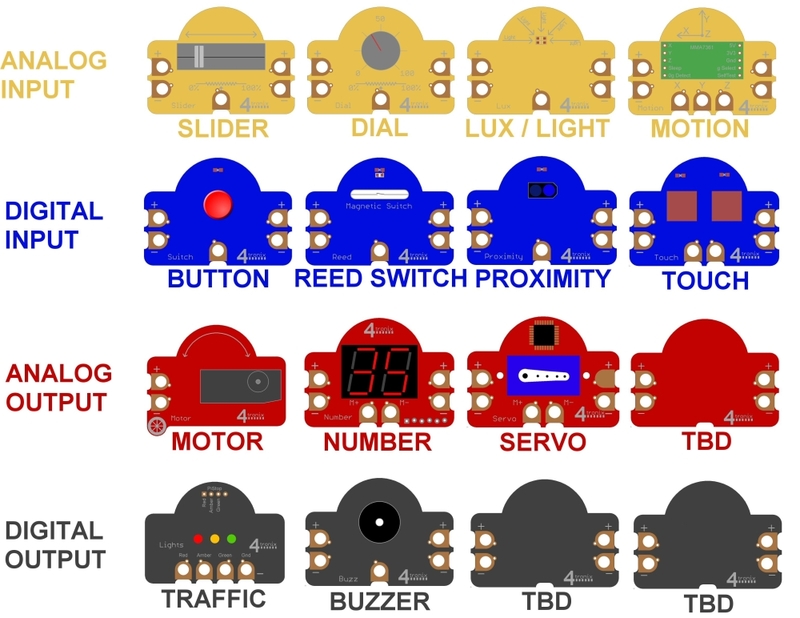 The Crumble has 4 general purpose IO (GPIO) connections, labelled A, B, C, D. These are all interchangeable for everything except driving Sparkles, which can only be done using GPIO D.
CrumbleBot Mk2 brings each GPIO connection to 2 positions on a jumper block. 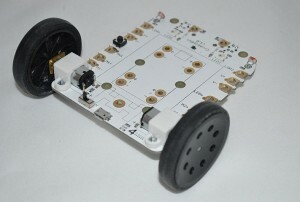 The other side of each position is connected to one of the functions of the CrumbleBot. Thus, you can use the little Yellow jumpers to connect from a GPIO to one of the functions on the CrumbleBot2. 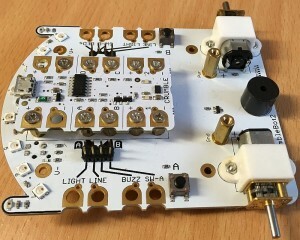 For instance the top row on the left-side connector block is connected to to GPIO A (on the right of the connector block) and to the left side Light sensor (on the left of the connector block). Fitting a Yellow jumper across the top row will therefore connect the light sensor to GPIO A. 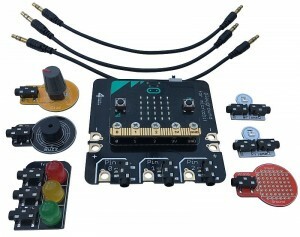 If instead you connect the yellow jumper to the next row down, you would be connecting GPIO A to the line sensor. 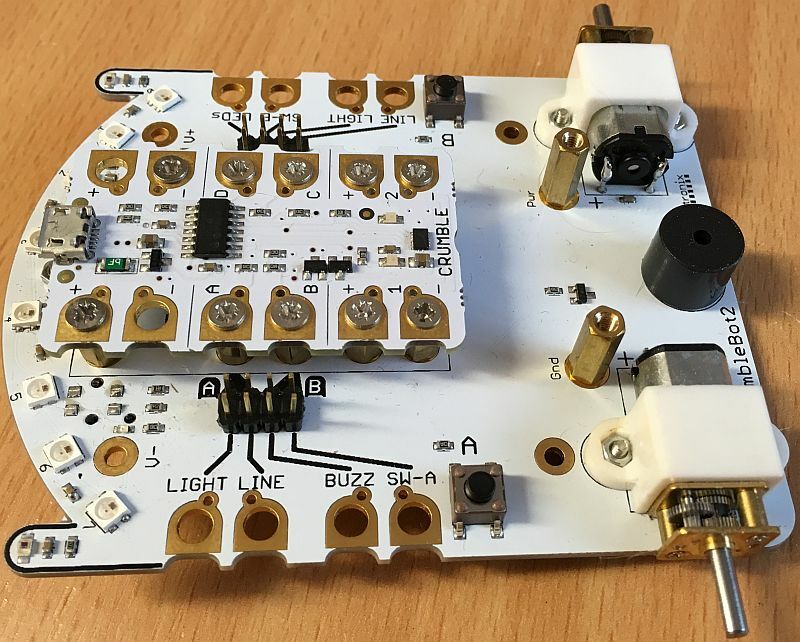 (As an aside, it is possible to connect each GPIO to 2 different signals at the same time – this won’t damage anything but will give unexpected results). The Crumble has its own motor drivers which are connected directly to the motors on the CrumbleBot. 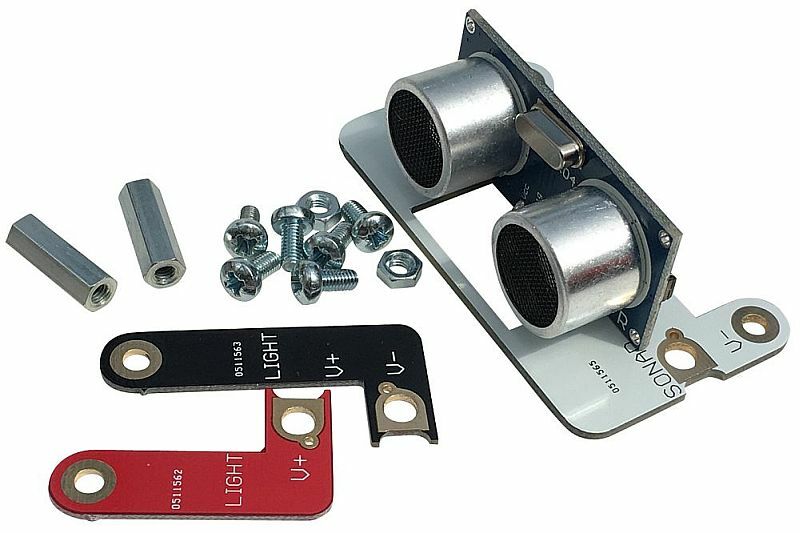 You do not need to make any special connections to make these work. Each Motor is driven independently and you can select the speed (0 to 100) and direction (Forward or Reverse) in your code. 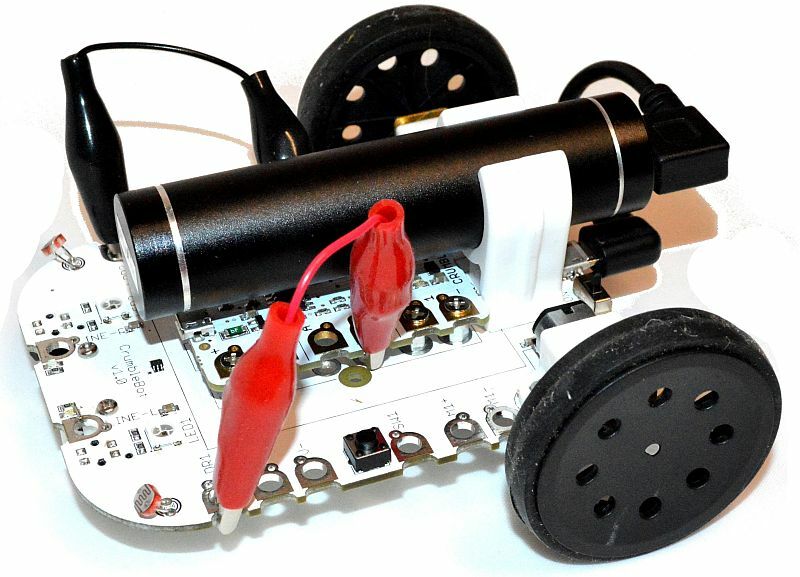 The LEDs on the CrumbleBot2 are called “Sparkles” in Crumble-speak. You can easily code them to flash different colours using the colour-picker, or by setting different Red-Green-Blue (RGB) values. First of all, make sure that GPIO D is connected via a jumper to “LEDs” – this is the default setting of the yellow jumpers. Of course, you can set each Sparkle to different colours and brightnesses – they do not have to be all the same. The following code implements a “Larson Scanner” famous from the KITT car in the Knight Rider show. It’s a bit complicated, but bear with it. The CrumbleBot2 has built-in, digital, line following sensors. 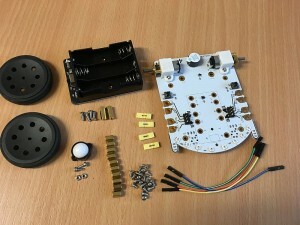 Make sure that the jumpers are set to connect GPIO A to the left line sensor and GPIO C to the right line sensor. This is the default setting. The following code drives forward until one of the sensors detects a line, then it turns toward the line until the line is not detected any more. This is a very inefficient “way to do it” (algorithm). Can you find a better algorithm for following lines? You should make the black line out of something that doesn’t reflect light, with the background being a good reflector. 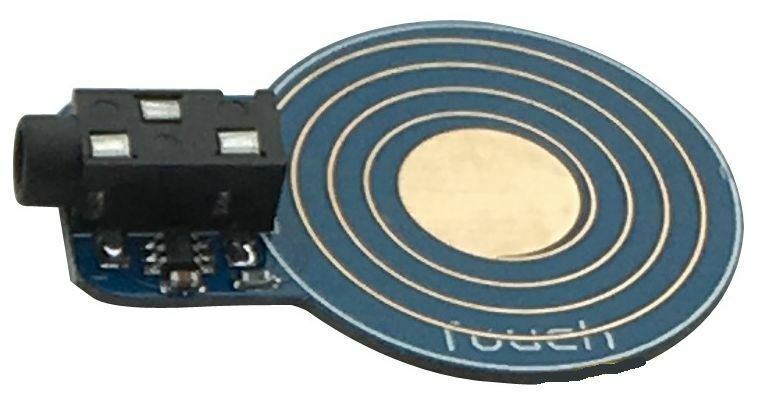 Black electrical tape is good and so is printing black lines on a laser printer – here is a good resource for printing line-following tracks. 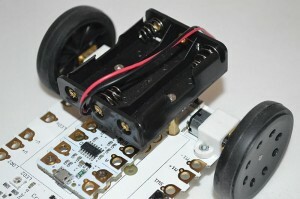 The CrumbleBot2 contains a little buzzer (small, round and black, underneath the battery holder). 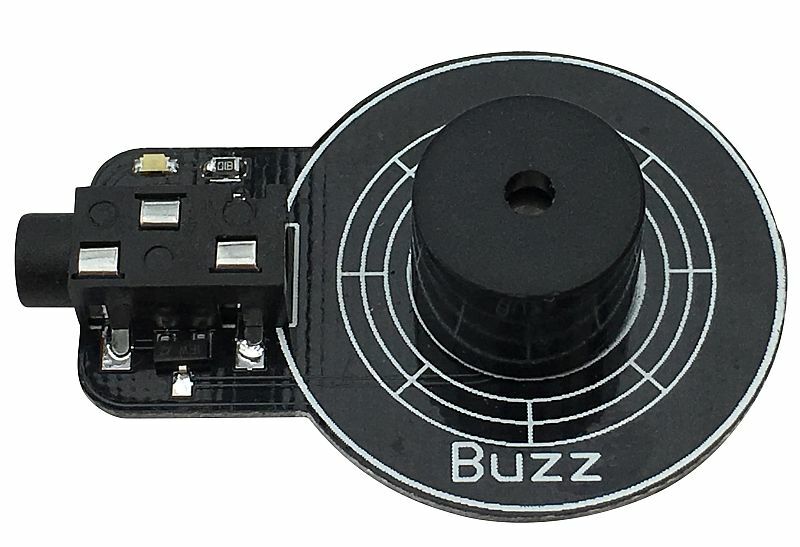 This buzzes loudly (quieter if the sticker is left on the top!) when the input is set to Hi. CrumbleBot2 has 2 light sensitive transistors which produce an analog value from 0 (very dark) to 255 (very bright). We can use a similar program to the line follower. What we want to do is turn the robot to the side that has the most light. Because the light sensors can vary a lot, we must be careful that we don’t turn the robot every time there is a very slight difference in light levels, otherwise it would spend all its time turning and never move forward much. So we create a guard band in the software and make sure the light levels are sufficiently different before we decide to turn the robot. This is why we compare the X and Y variables and make sure there is a difference of at least 10, before turning. 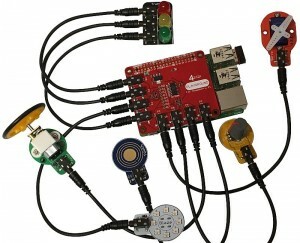 The Playground system allows you to connect external electronics (inputs, outputs, sensors, etc.) to your controller. 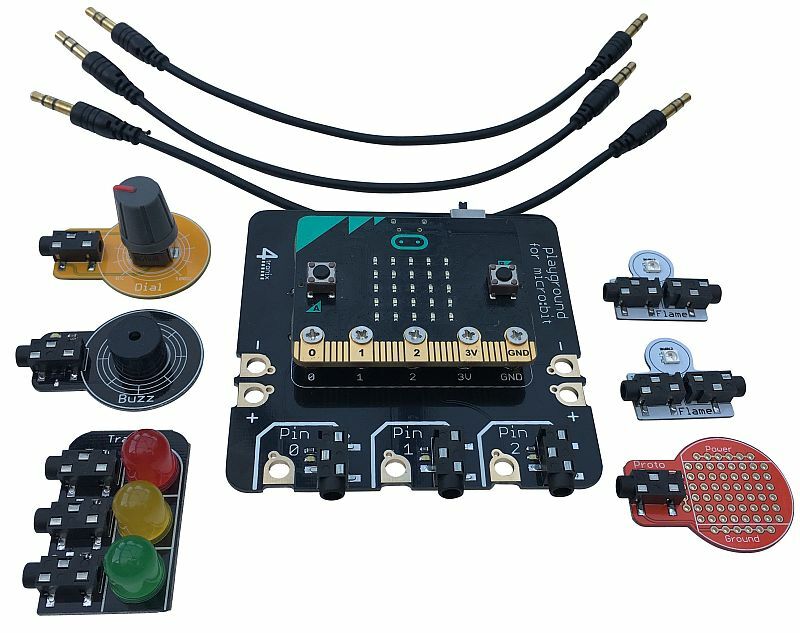 Currently supports Crumble (from Redfern Electronics), Raspberry Pi and the BBC micro:bit. 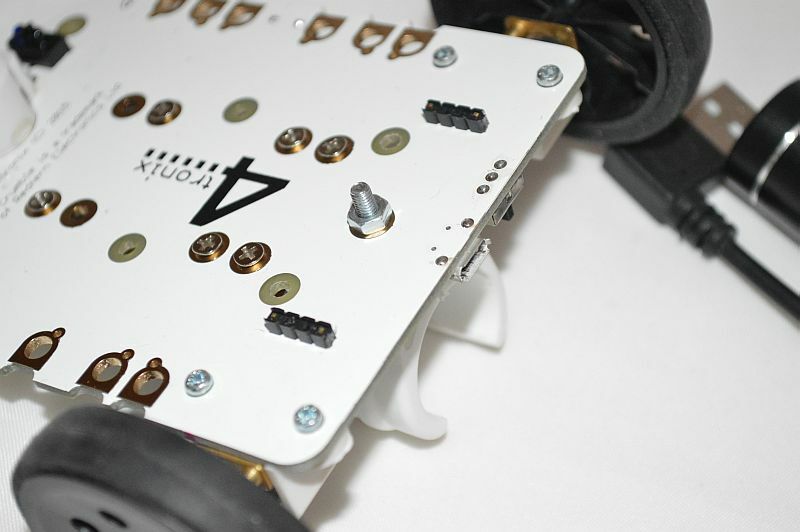 The connections from the controller are converted to 3-pin 3.5mm jack connections and the connecting cables are 20cm jack cables – although longer cables can be used if required. The separate electronic parts, Gizmos, can be used with any Playground. The exception being the Motor Gizmo, which can only be used with Crumble, as the micro:bit does not have integral motor drivers. 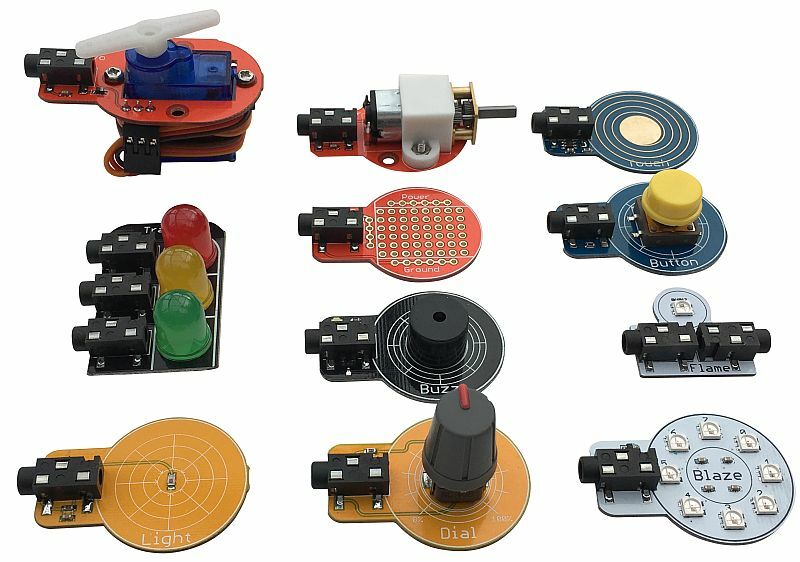 All of the Gizmos can be used within your programs using the built-in drivers for the relevant part. 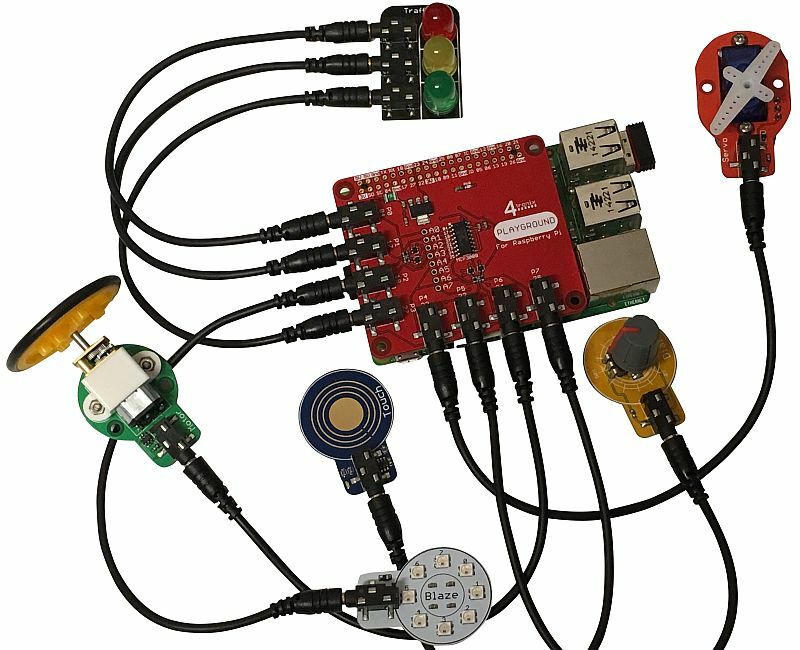 We have created a python library module that allows you to use the Playground for Raspberry Pi easily and quickly. 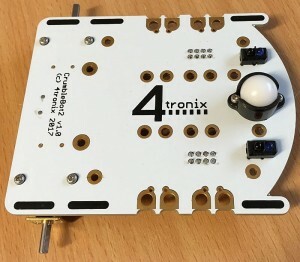 You can install this from your Raspberry Pi connected to the internet as follows. 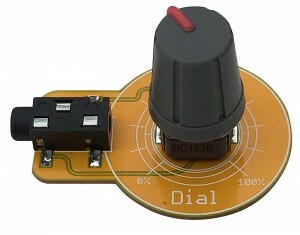 This provides a simple digital input to Playground. It is Active (High) when pressed and inactive (Low) when not pressed. 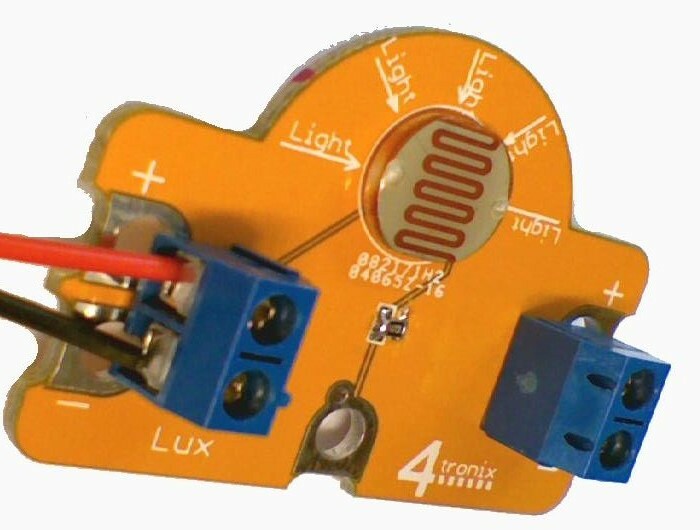 There is a white indicator LED to show whether it is active or not. 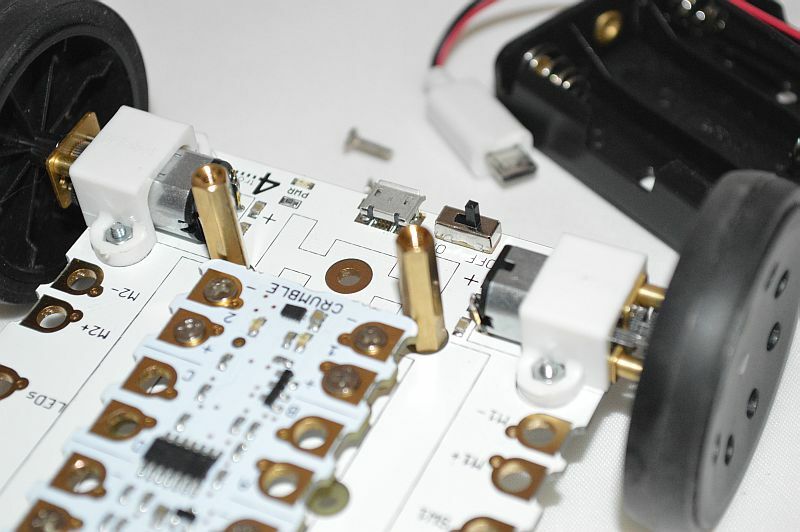 This simple Gizmo allows you to build your own Gizmo for those inputs or outputs that are not yet available as a ready-made Gizmo. 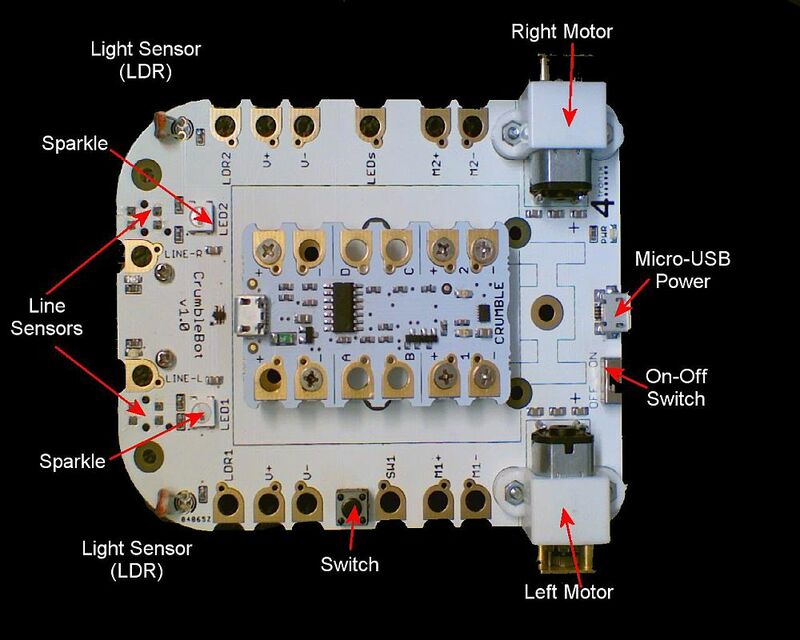 For instance, you could make a temperature sensor, or have a controllable relay. 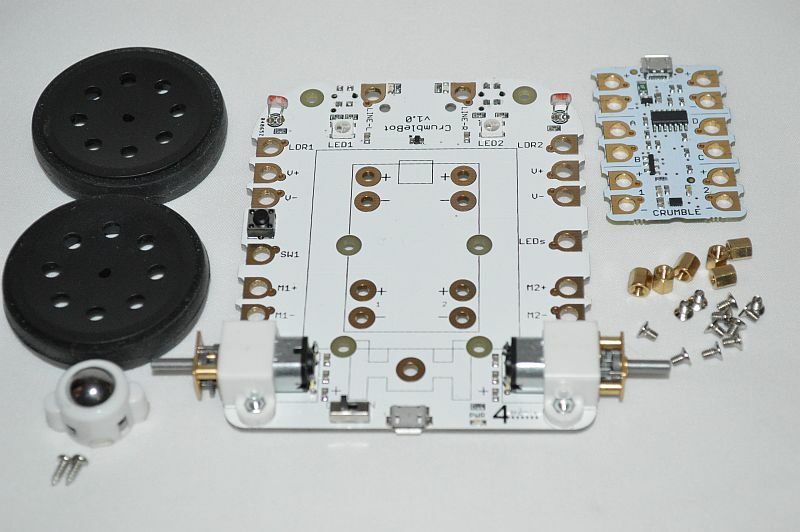 The board has 4 holes for the Signal, 6 for each of Power and Ground, and 48 for you to use for your creation. You will need version 25.5 or later of the Crumble Software – see the link above to download it. The Black negative power connector PCB is fitted on the left side of the CrumbleBot with the writing facing upwards. 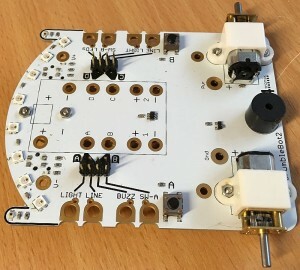 Screw in the Red positive power connector PCB onto the right side of the CrumbleBot using a screw and nut into the connector marked V+. Don’t tighten the screw. If the servo is not pointing straight ahead, pull off the top PCB with the sensor on and fit it onto the servo again so it is pointing ahead. Then tighten the screw. 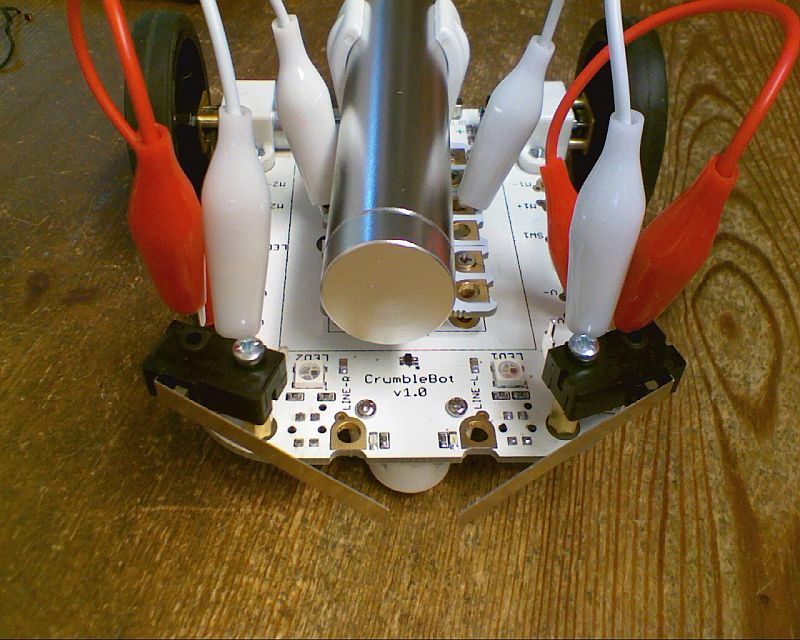 The CrumbleBot is a fantastic way to introduce coding with the Crumble to children of all ages, and especially primary school children. 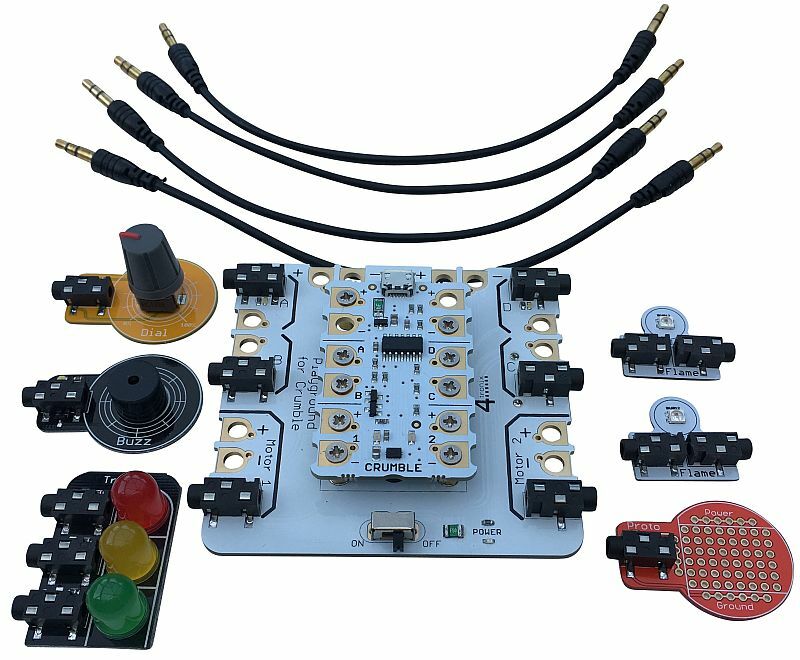 It provides a ready-built platform to experiment safely and easily with analog and digital, inputs and outputs. 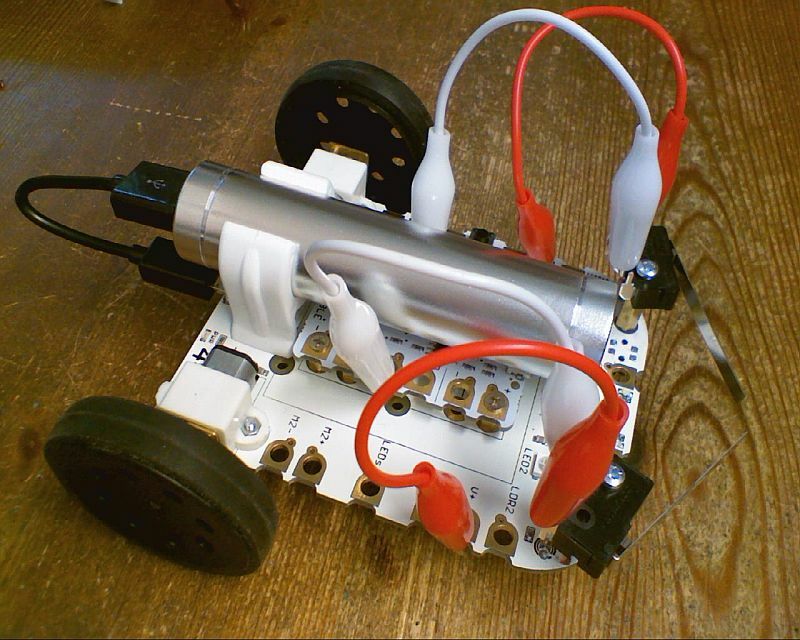 It moves, it shines lights and it reacts to its environment – but only if your coding tells it to. In this guide we take you through the process of assembling the CrumbleBot and show you how to start coding to do real-world physical computing. Before you know it, the children will be telling you how to improve it! There are 6 pillars. 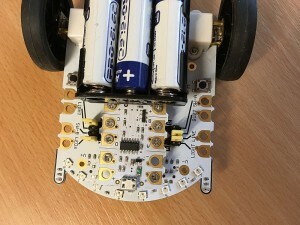 The four at the back must be placed as shown as these connect the motor outputs from the Crumble to the motors on the CrumbleBot. 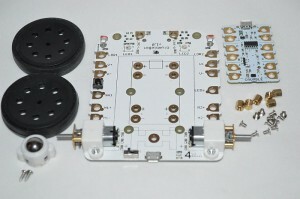 The front 2 pillars must be placed one next to a positive (+) and one next to a negative (-) connector. It doesn’t matter if you use both on the left side, both on the right, or one left and one right. Juste ensure you have one +ve and one -ve. Screw the pillars in as tight as you can so they won’t move when the Crumble is attached. Use the remaining 6 small screws to fit the Crumble to the pillars. 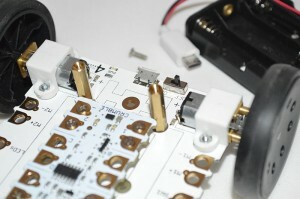 Ensure that the USB connector on the Crumble faces the front of the CrumbleBot as shown in the photo above. 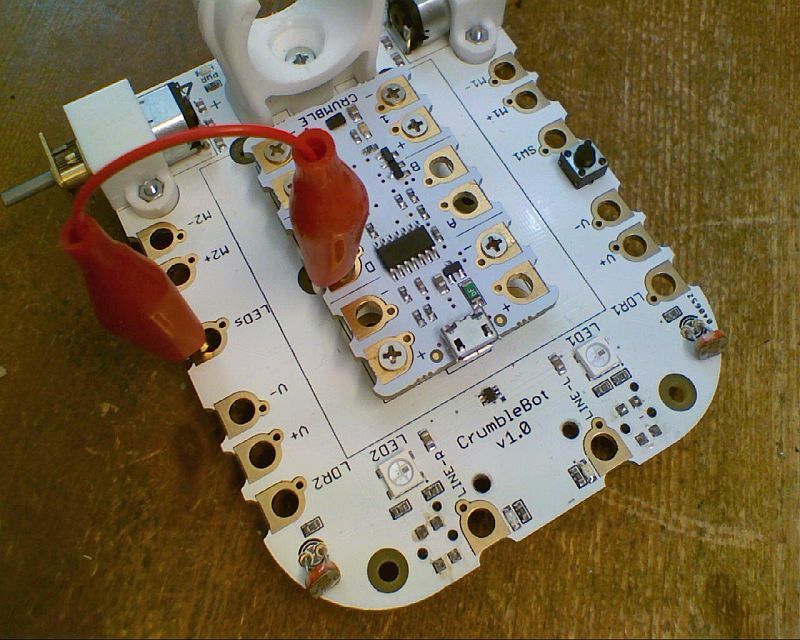 You have now built the CrumbleBot. That was easy wasn’t it! The new battery holder is fitted to its own black PCB with switch, indicator LED and fuse. This complete assembly screws to the top of the 20mm pillars supplied. The two pillars fit directly behind the Crumble as shown in the photo above. 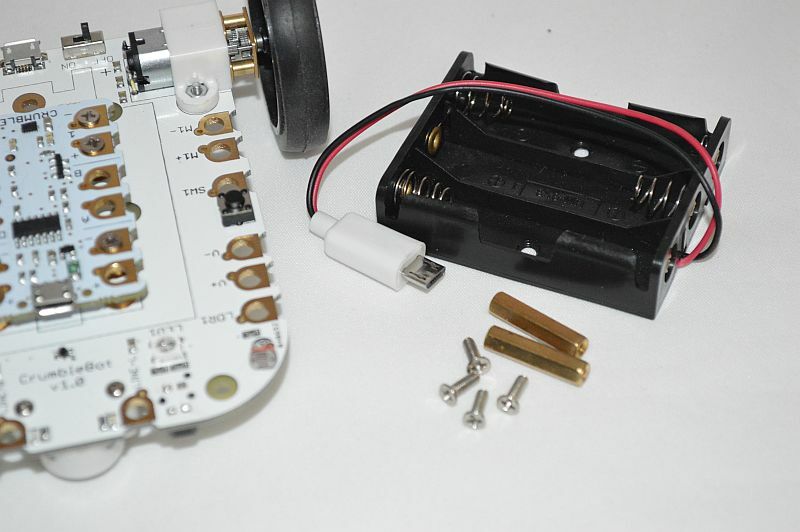 Use the 2 remaining 8mm screws to screw the battery holder to the mounting pillars. 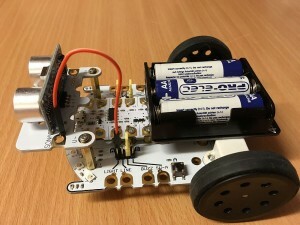 You have now completed your CrumbleBot with AA battery pack. Time to learn how to code! 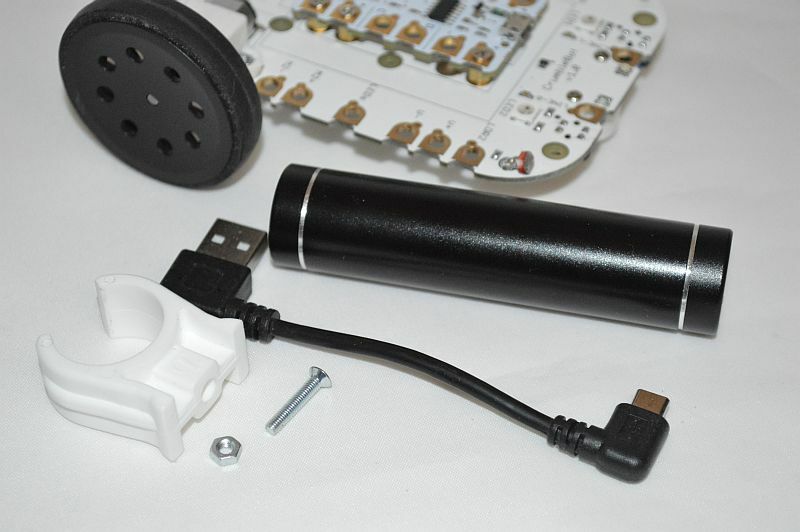 Push the USB Battery Pack through the clip from the front. Do not attempt to clip it in from above as it is very stiff. The crocodile clips can be very slippy within the soft rubberised covers which can make them difficult to grip and clip onto things. 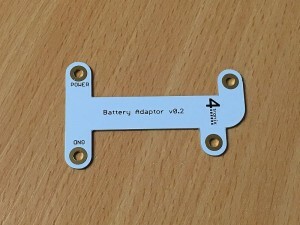 We therefor provide some rubberised tubular sleeves. ** Please note that only the motors are permanently connected. 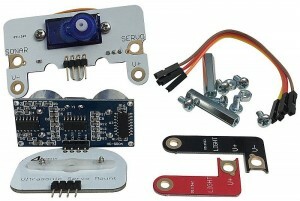 All other features require one or more croc clips (included) to be connected from the Crumble to the Crumblebot. 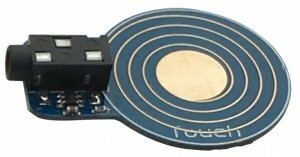 This allows more features to be included than can be active at any one time. 2 light sensors. These are ANALOG INPUTS to the Crumble and will give a varying value between 0 (totally dark) and 255 (very bright) depending how bright the light shining on them is. 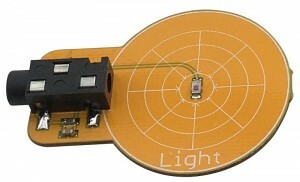 Use these to search out the brightest place to be, or the darkest place to hide! 2 Sparkles. 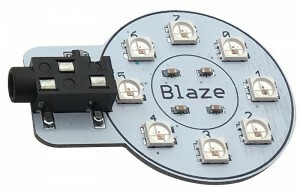 When connected directly to the Crumble these are Sparkle 0 (labelled LED1) and Sparkle 1 (labelled LED2). You can control the brightness and colour of these Sparkles independently – why not use them to show what your CrumbleBot is doing? 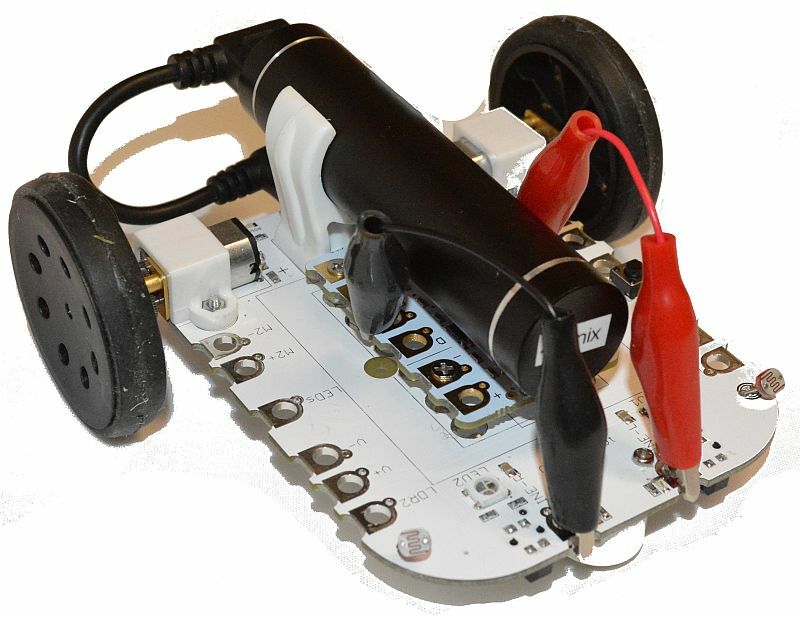 You can set the speed of each motor independently to between 0 and 100%. 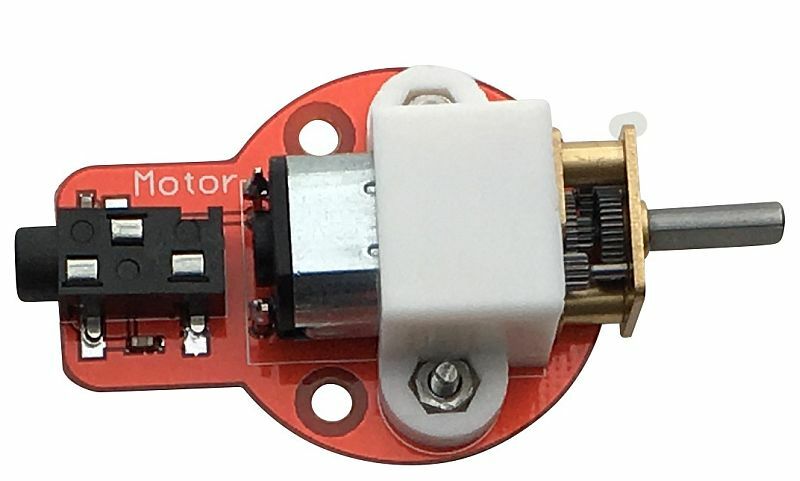 You will find that the motors won’t have enough power to turn if the speed is set too low; maybe less than 20% will be too low for the motors to move. 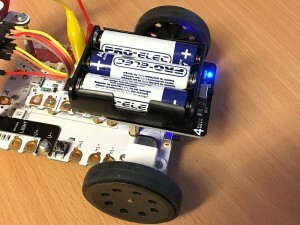 Setting the speed to 100% will move the motors at their fastest speed. 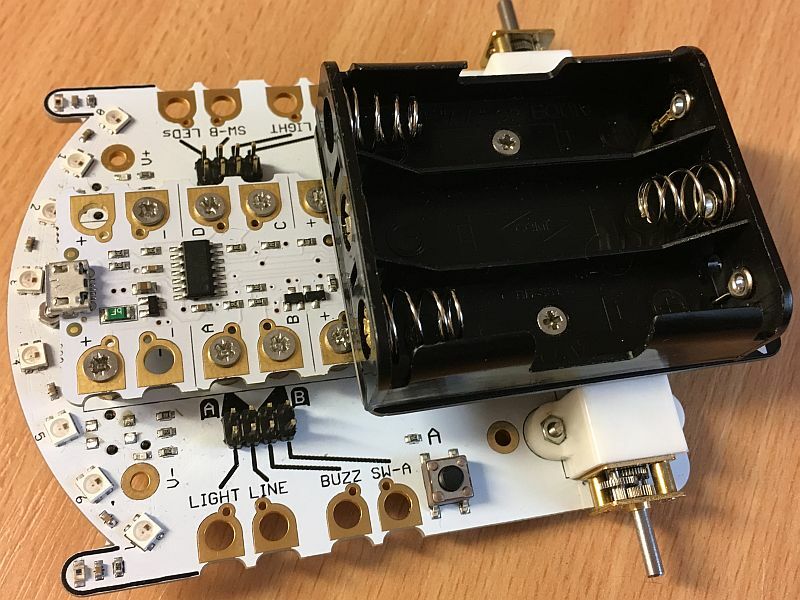 3 – Let There be Light! 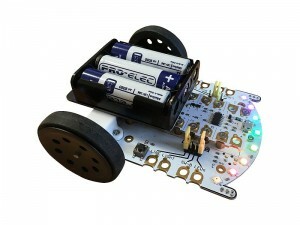 Let’s get the Sparkles on the Crumble Bot going. 4 – Follow That Line! The CrumbleBot has 2 line follower sensors on the underneath at the front. These have associated LEDs which light up when a black (non-reflective) line is detected. Red for Left (Port) and Green for Right (Starboard). 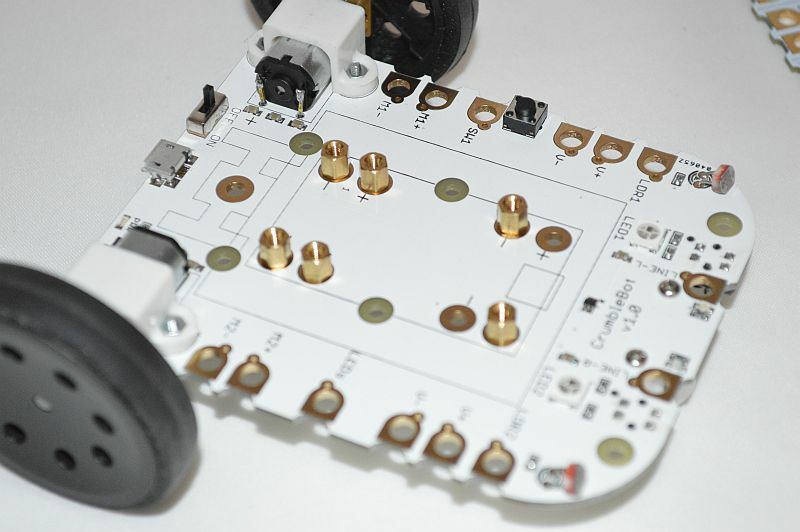 These LEDs are active any time the CrumbleBot is powered up; they do not require any software on the Crumble. The CrumbleBot has 2 light dependent resistors (LDRs) at the front left and the front right. These produce analog values from 0 to 1023. 0 means there is no light at all, whereas 1023 means there is lots of light. In practice you will only see readings well within these 2 extremes. Why not try and change the code so the robot finds the darkest place to hide? 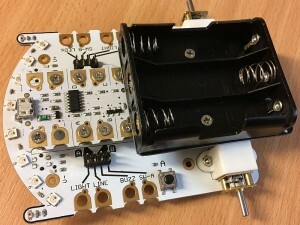 6 – Check that Switch! 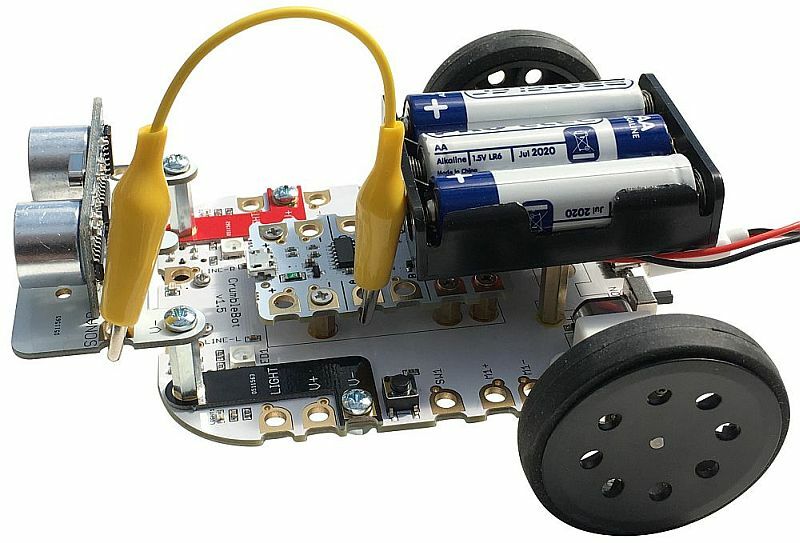 The CrumbleBot has a little switch on it that you can use to change what is happening in the program or simple to react by switching on LEDs. Now we can write a program that checks to see if the switch is pressed. It will be Hi if pressed, or Lo if not pressed. The CrumbleBot has 2 holes near the front that you can use to add sensors. 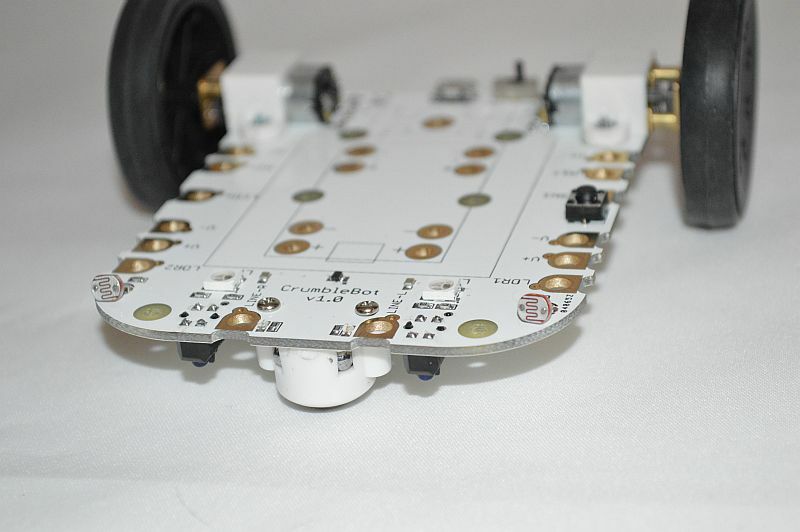 In this section we are using the microswitch kit to add obstacle sensors to the CrumbleBot. 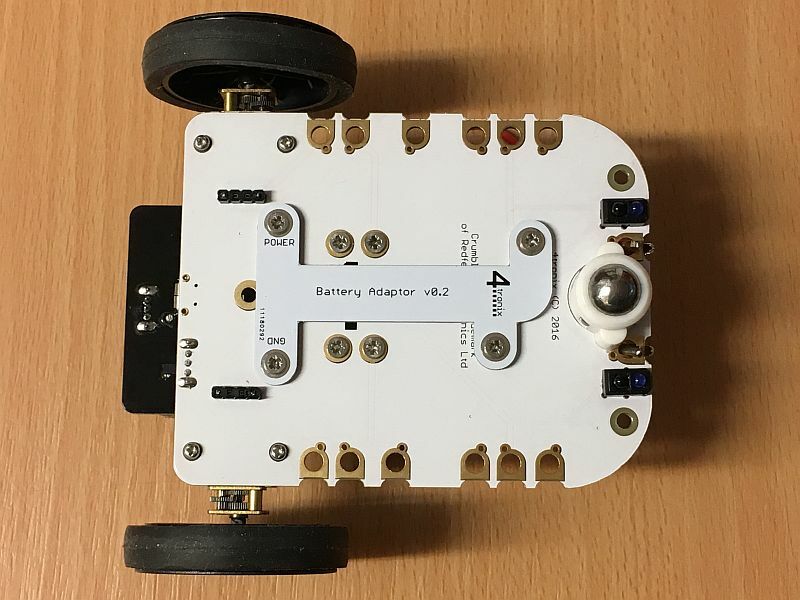 For the Avoider program, which is similar to the line follower and light seeker, we make the robot reverse and turn when it hits an object. 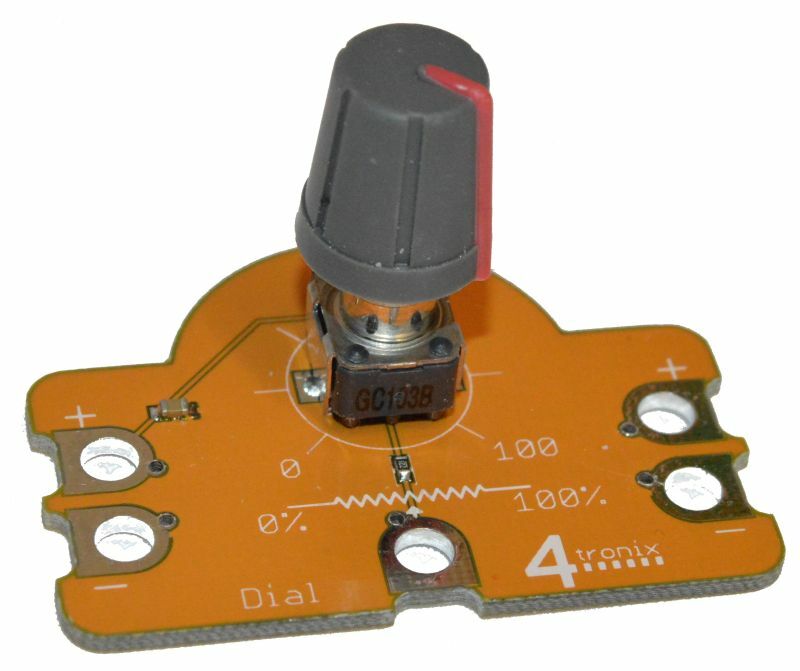 If the left microswitch hits, then we turn right, and if the right microswitch hits then we turn left. This gives us a chance of avoiding the object. 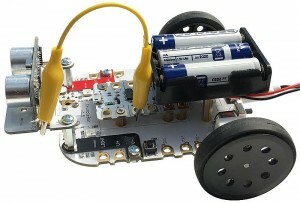 The program also recognises when both switches hit an object together and stop the robot. Download a PDF of this guide complete with Code examples from here. 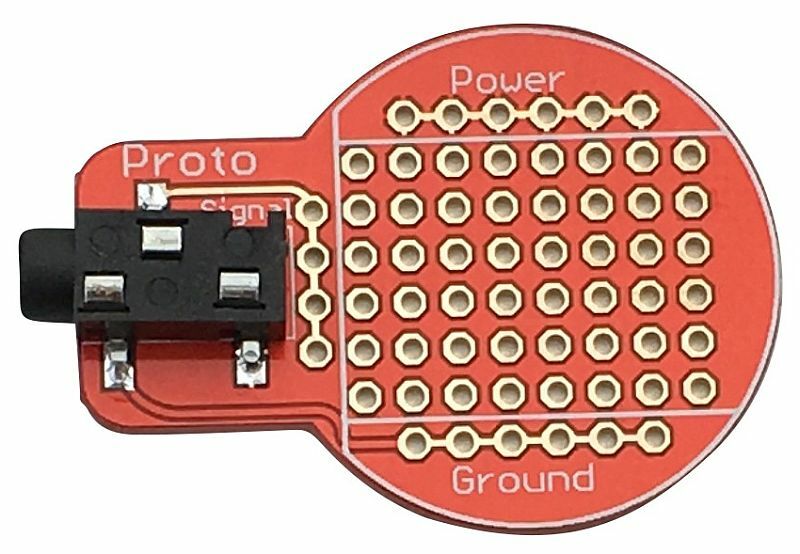 Most Crumbs require a 5V Power and Ground connection to be made before they work fully. 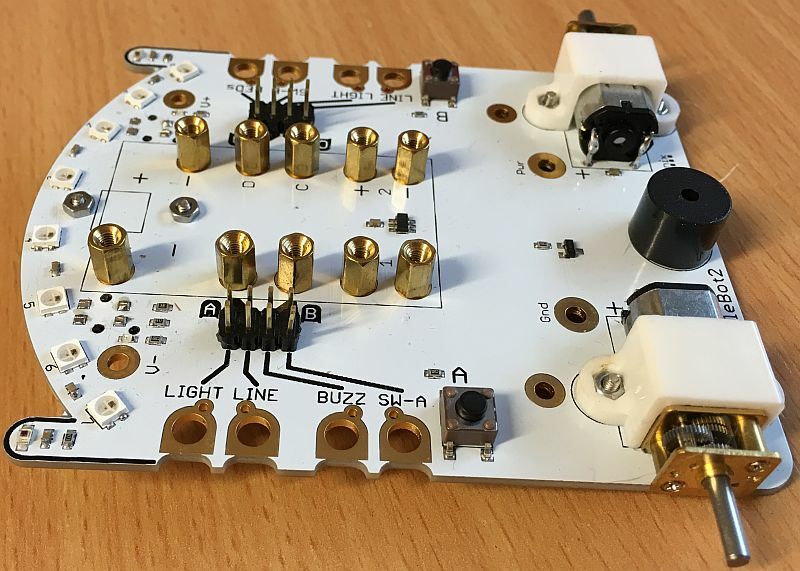 Sometimes this is to power the on-board electronics and sometimes, simply to ensure that the indicator LED works as expected. 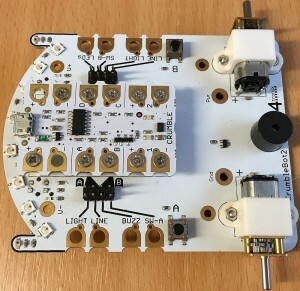 Although the Crumbs are generally protected against connecting power on the wrong way round, or onto the wrong pin, it is recommended that you use some sort of colour coding so that the children can see how the positive power flows (using Red wires) or the negative with Black wires. 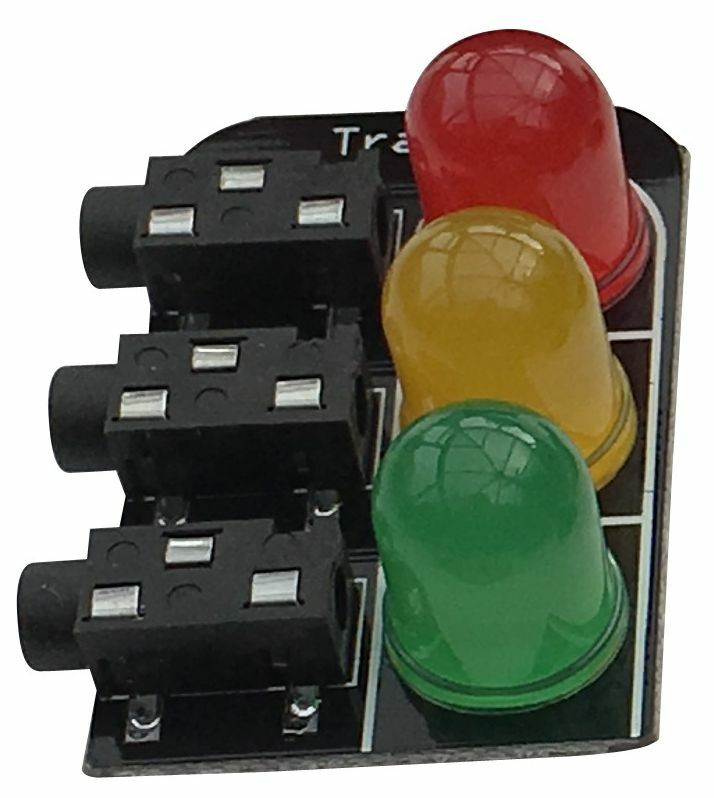 You can use Green as an alternative to Black if you run out, but Yellow, White and Green are good colours to use for the general purpose inputs/outputs or motor outputs. The program below uses the value read from the Dial Crumb connected to Input A to set the speed of Motor 1. Note that the maximum value for motor speed is 100, so we divide the value from the Dial Crumb by 3 to be sure it fits into this range. 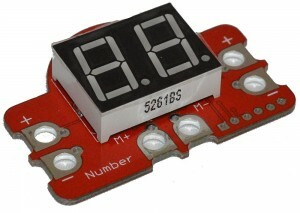 This requires Power and Ground to be connected and the output connected to A, B, C or D. The analog value read will be in the range 0 to 255, with 0 being total darkness and 255 being extremely bright. 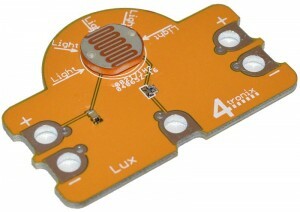 The program below uses the value from the Light Sensor Crumb to set the brightness of the Red element of Sparkle 0. So in a dark room, the Sparkle won’t be as bright as in a bright room. 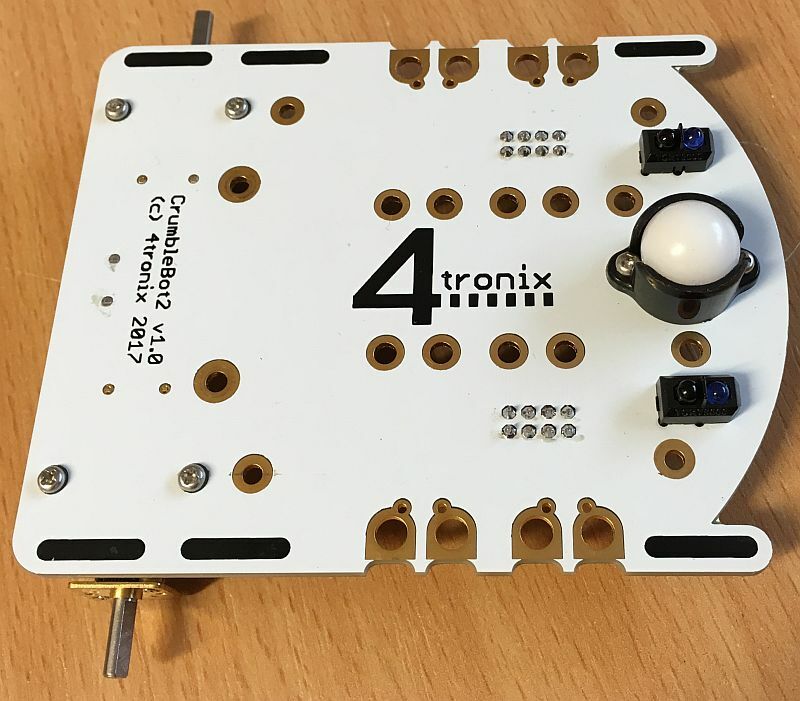 You can tilt the board in X, Y or Z axis and the appropriate output will change its value. Maybe you can use this to steer a robot? 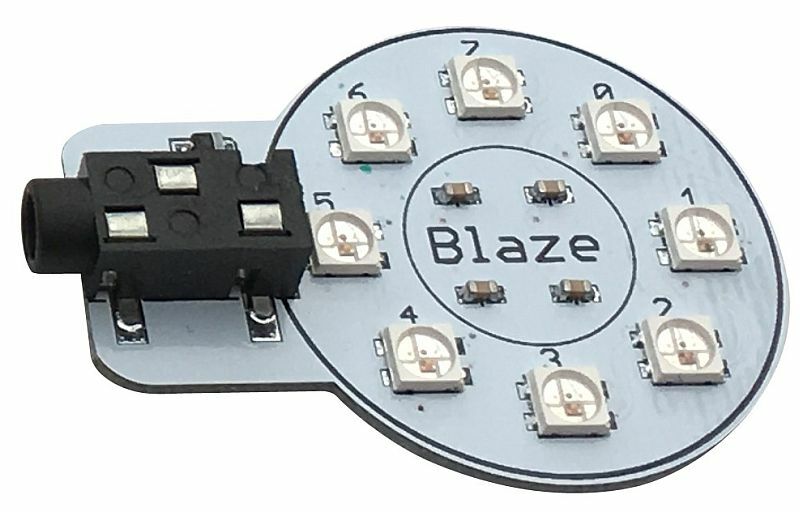 The program below extends the program for the Light Sensor Crumb by using all three axes of the Motion Sensor to set the three colour elements (Red, Green and Blue) of the Sparkle. So twisting and turning the Motion Crumb will change the brightness and colour of the Sparkle. 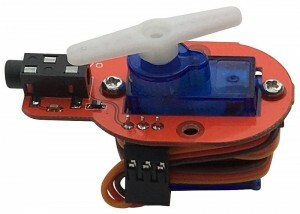 This requires the Power to be connected in order for the button to operate. In addition, you should connect the Ground so that the indicator LED operates. This requires the Power to be connected in order for the Hall Effect switch to operate. 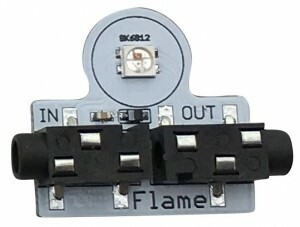 In addition, you should connect the Ground so that the indicator LED operates. 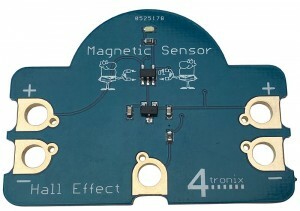 The program below counts the number of pulses received from the Magnetic Switch Crumb. Maybe the magnet is on a wheel spinning round past the Crumb and this is counting the revolutions of the wheel?